We’d love your help. Let us know what’s wrong with this preview of Justin’s Season by S.M. Sawyer. The year is 1988, and Justin Davis, a former nationally recruited football prep star, awakens from twelve years of masking his shame with drugs and alcohol to find he has been returned to his former self through what can only be described as a miracle. Triggered by the confirmation of his closely guarded sexual orientation, his fall from grace of over a decade before sets t The year is 1988, and Justin Davis, a former nationally recruited football prep star, awakens from twelve years of masking his shame with drugs and alcohol to find he has been returned to his former self through what can only be described as a miracle. Triggered by the confirmation of his closely guarded sexual orientation, his fall from grace of over a decade before sets the stage for his redemption. The fulfillment of his destiny is prompted by Providence and the serendipitous deeds of those who are a part of his new life, as their intertwined lives are likewise impacted. Though his rapid evolvement and acceptance of his homosexuality is countered by setbacks, Justin perseveres and eventually triumphs as fate, he believes, has led him back to the sports arena to recapture past glories. In a stunning finale, however, he learns his destiny is not what he had envisioned. His calling has been thrust upon him by circumstances beyond his control. Can Justin embrace it and become the man he was always meant to be? To ask other readers questions about Justin’s Season, please sign up. I loved this story, especially young ones face many problems in their life and in order to not face them will turn to drugs or alcohol. This story explores one such young man. The fact that he awakens one day and suddenly has a realization that he must turn his life around is just short of a miracle, if not a miracle! His acceptance of his responsibility to get back on track and face his problem is so inspiring. Many people these days don't accept that responsibility. Yes, to be inspired and have I loved this story, especially young ones face many problems in their life and in order to not face them will turn to drugs or alcohol. This story explores one such young man. The fact that he awakens one day and suddenly has a realization that he must turn his life around is just short of a miracle, if not a miracle! His acceptance of his responsibility to get back on track and face his problem is so inspiring. Many people these days don't accept that responsibility. Yes, to be inspired and have the faith that the Almighty above lends a helping hand in these difficult times is what leads us to the right path. I'm not really sure where to start with this review, so I'm gonna just ramble on. First things first, this is not a romance, if you're looking for some hot loving and a happy ever after, this is not the book for you. This is a story of redemption, one man's fight to right the wrong's of his past. Everything went to hell in a handbasket for Justin just when he was starting to question his sexuality and he's been hiding behind drugs and the bottle for the last 12 years. He wakes one morning, has a I'm not really sure where to start with this review, so I'm gonna just ramble on. First things first, this is not a romance, if you're looking for some hot loving and a happy ever after, this is not the book for you. This is a story of redemption, one man's fight to right the wrong's of his past. Everything went to hell in a handbasket for Justin just when he was starting to question his sexuality and he's been hiding behind drugs and the bottle for the last 12 years. He wakes one morning, has an epiphany and starts setting about getting his life back on track. In the process, he meets Matt and is finally able to admit that he is gay and in love with another man. All of this is good, I am all for people sorting themselves out and building a better life for themselves. Now for what I didn't like, it felt at times like I was sitting reading a very long sermon. Justin and everyone around him spend a lot of time praising the miracle that restored Justin to life. It felt very much like the good were rewarded and the bad were punished or given a chance at redemption. Matt's story felt very much like a punishment for perceived past sins and that did not sit well with me. That said, the story was very well written and if you like inspirational books, you'll probably like this. I was in awe reading this book as it wasn’t your typical historical novel since it is set in a time that isn’t that far numerically from our own, except it was like stepping back in the past to a time (quite recently) where homosexuality was deeply hidden in closets, especially in small southern towns. It was a time of HIV/AIDS where the disease was blatantly seen as a “gay” man’s disease and garnered little sympathy from the American public. It was a time where bei A Joyfully Jay review. I was in awe reading this book as it wasn’t your typical historical novel since it is set in a time that isn’t that far numerically from our own, except it was like stepping back in the past to a time (quite recently) where homosexuality was deeply hidden in closets, especially in small southern towns. It was a time of HIV/AIDS where the disease was blatantly seen as a “gay” man’s disease and garnered little sympathy from the American public. It was a time where being outed as a gay man could ruin a man’s sports career. It is in this unforgiving world that this story is set. This story also wasn’t your typical romance book. While there is a romance that brews within the storyline, it isn’t the main theme of the story. In fact, if I was to classify what kind of book this is, I probably would say it was more of a story of one’s man’s journey through life and the people he meets, about how these people impacted Justin’s life and how Justin impacted their lives. Each of these characters is laid out for readers – the good, the bad, and the ugly. Read Wendy’s review in its entirety here. A book for all to read, since it provides well developed characters, suspense, understanding of acceptance, and a message of hope. This is an absolutely beautiful story. I feel like I was let in on this personal miracle with the climax of the book ending for me today, Easter Morning. Finishing up this book this morning and reading Justin's speech was so fitting for today. I believe God truly moves us right where we need to go. Justin’s Season is journey of discovery, redemption and love with Justin touching the lives of everyone he encounters. As many of you already know, I will never include spoilers in my reviews This is an absolutely beautiful story. I feel like I was let in on this personal miracle with the climax of the book ending for me today, Easter Morning. Finishing up this book this morning and reading Justin's speech was so fitting for today. I believe God truly moves us right where we need to go. Justin’s Season is journey of discovery, redemption and love with Justin touching the lives of everyone he encounters. As many of you already know, I will never include spoilers in my reviews so believe me when I say, this book is totally worth reading. It’s 1977 and Justin Davis, a high school senior, has it all. He’s the class hero, most likely to succeed, he excels in every sport, and he is the top quarterback recruit in the nation. All the powerhouses in the Big Ten want him. But then one night, while Justin is trying to understand his own feelings and sexual orientation, everything changes. Now it’s 1988 and Justin has spent the last 12 years drinking, doing drugs and hiding away from the world. He’s journey begins one morning with the sun shinning into the basement of his brother Mark’s house where Justin has been staying. Will Justin take this opportunity he has been given and follow the path and journey his angles are leading him on? You will not regret reading this book and following along with Justin. You will meet some interesting people along the way and see how one man’s journey and destiny can alter many others. I truly believe God has a plan for each of us and we have to be open enough and trusting enough to go where we are lead. 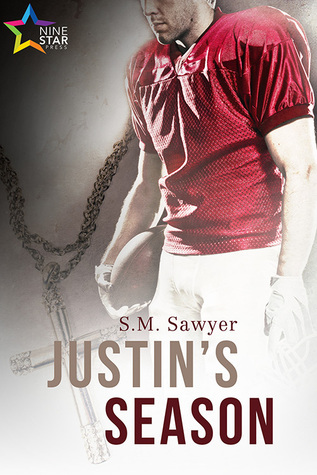 I’m very thankful S. M. Sawyer shared Justin’s journey with me. There is a speech Justin gives towards the end of the book and it’s my favorite scene. I hope you enjoy it as much as I did. First off, this book is definitely not a romance nor does it end on a HEA, it’s more an inspirational story with some religious undertones, it’s heavy on the sports’ theme, too, so proceed at your own risk. Justin is living in his brother’s basement, relying heavily on alcohol and drugs after losing his prospective NFL career as a quarterback, when he has an epiphany and suddenly turns his life around, moving out and finding a job that leads to a career on a major league’s baseball team. In between, the reader is given flashbacks to Justin’s life and how realizing he was gay and having to be in the closet, seeing as things were even more difficult in the late 70’s and 80’s for gay men, was the catalyst that led to Justin becoming an alcoholic and a drug addict. There were some elements of the story that were a little over the top for my taste, but the book is well-written, and it’s undeniable that S.M. Sawyer is a talented writer and even if it wasn’t what I expected from the blurb, it still was an entertaining read of redemption and finding your own way even when it's not exactly what you, or in this case, Justin expected for himself. It started out a little slow but I liked the story and the message. It was an interesting way to get the story across and inspiring. I should note first off that while I rated this 3 stars, readers who enjoy Christian themes in their works may likely rate it higher (I checked to see if this was being marketed as Christian fiction, but it appears that it was not, and if it was up to me, it definitely would be, as there was too much to ignore, particularly for someone who goes out of her way not to read Christian fiction). A note to interested readers that the Christian theme is not subtle and is significant in terms of the plo I should note first off that while I rated this 3 stars, readers who enjoy Christian themes in their works may likely rate it higher (I checked to see if this was being marketed as Christian fiction, but it appears that it was not, and if it was up to me, it definitely would be, as there was too much to ignore, particularly for someone who goes out of her way not to read Christian fiction). A note to interested readers that the Christian theme is not subtle and is significant in terms of the plot. At first I thought this was a story about one man's self-acceptance, but after the 60% point, I think I realized that it wasn't as much the point of the story as I had initially thought. The base of Justin's Season is a solid, very lovingly-crafted story about one man coming to terms with his own identity at the cornerstone of a time of social change. There is some very lovely prose here - I marked down the phrase "an oak tree among life's willows" as one that I thought was really, particularly vivid and wonderful, and you can tell as you are reading the thought and care that went into creating the story by the author (the dedication was touching). As someone who very much enjoys baseball, I was pleased to see that the cover led me astray and that it was focusing on baseball instead, and I had no trouble keeping up with the narrative when the bulk of the plot focused on that (perhaps a good 15-20%). I've also lived in Ohio and grew up in a fairly small town in the midwest, and the atmosphere of that world was done incredibly well. The fear and behavior of those living in the 80s as this was taking place - the AIDS crisis, queer identities becoming more public, the fear of being exposed - was believable and accurate. All of these points wove together to make a nice, feel-good story that also happened to provide a lot of insight to those times and places. I wish that the author had chosen a catalyst for Justin's transformation that wasn't "he woke up and felt different - a miracle!" because I don't subscribe to this particular belief system, and as a reader, not believing in the protagonist's change of heart really impacted a lot of the story. Even a simple catalyst would do, like Justin, inebriated, almost drowned in his bathtub and the terror was strong enough to open his eyes. But as such, I found it hard to connect to the early redemption parts of the storyline because of this. And I also wish we'd been able to see WAY more of the romantic relationship within the pages - it was important and we didn't get to see virtually any of the chase, them falling, or what drew them together besides "proximity." I wish we had gotten far more of this connection - so we could then believe in it, and let that guide our reactions to the remainder of the novel - rather than the long exposition in the beginning about Justin's backstory. But I realized that it was meant to be merely a stopping point,rather than the focus, as I neared the end of the book, as it was far more a journey story than a romance, and perhaps that was why the author chose to skip over the majority of that. This was an unexpected story of redemption, love and spirituality. Justin was a character most of us could relate to - flawed and unsure at first and then turning the corner to a different road with acceptance and faith. The story was fast-paced, interesting and full of hope. Read this book! ARC kindly provided by NineStar Press in exchange for an honest review - thank you!